being little • bristol uk fashion & lifestyle blog. : ease me in. Hello, I'm slowly trickling back in to blogging land after a relaxing week back in Devon. I took loads of photos while I was away, and I'll be sharing them with you over the next week or so. Expect lots of pretty outfits and pictures of cats..
* I attended their TV advert launch party with about a billion other bloggers the other week and it was AWESOME. There are loads of blog posts on it if you find the #AXCircus hashtag on Twitter! I unfortunately forgot my camera, bad blogger! I love how cute this outfit is, really love the polo top! Your hair looks lovely with a little trim, not that it didn't look nice before haha, hope your ok without your Doug! You always look like such a cutie pie! What a cute outfit! :) I love your style and your hair is stunning! Adorable skirt! Love that spring is finally putting in an appearance and the florals can come out to play. 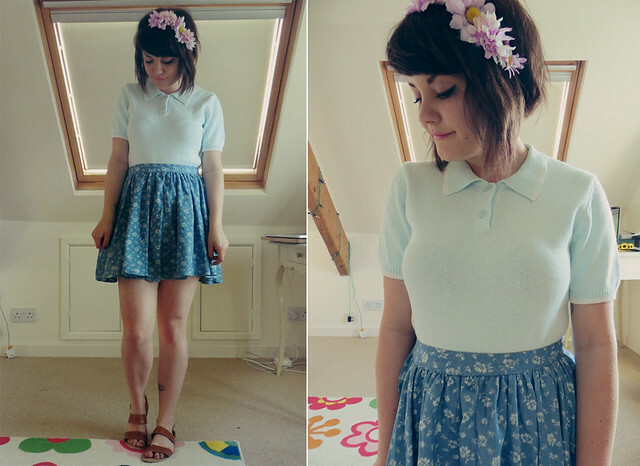 What a perfect spring outfit!I love the Crown and Glory headband and your new short hair suits you so much, I love it! This is super lovely, you look too cute. I love your knitted top and floral bandeau. Can't wait for Devon photos! So cute! I need to get myself one of those floral headbands before Festival season! Very tempted to buy that skirt, it looks absolutely lovely. You really make it look a treat with the polo top. Hope you're enjoying yourself back in Devon! I just stumbled across your oh-so lovely blog and couldn't stop reading. I adore your honesty about life, your health (I can relate in more ways than one), and enjoy your sweet sense of style. You have a new fan... I can't wait to read more! a girl can dream... avenue 32 wishlist.